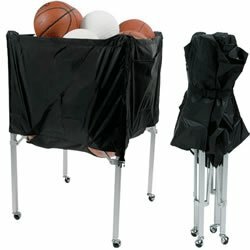 Wheel balls out to the court for sports practice or physical education class with this BSN SPORTS™ E-Z Fold Ball Cart. Everyone can grab a ball and start warming up, as the canvas sides and mesh bottom support up to 30 volleyballs or 20 basketballs, making it easy to get large teams and classes to participate in the action. Coaches can make sure the hardwood looks good for the big game with the cart's non-marring casters, which roll easily across gym floors without leaving unsightly scratches or marks on the court.